This pagoda is so unpopular that it has no name and but only the number 1277. It is behind Mirror temple. So, you must stop your vehicle and walk through the paddy field in front of the pagoda. The original temple is about 4 feet left on the ground but is maintained as Bagan style. It is the creation of 13th century. 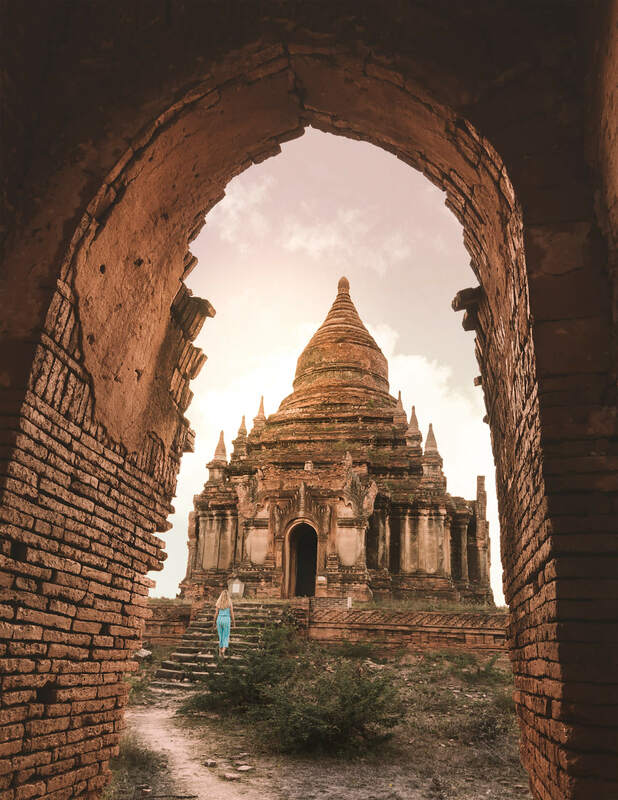 In spite of namelessness, the temple is one of the best in Bagan, showing the view of DaMhaYarZarKa temple and other small temples. Actually, even the 1277 temple itself is in series of three temples surrounded by small temples. So, if you are in Bagan, you should try this calm and beautiful place for your unforgettable sceneries. This underrated temple is double-layered temple, situated on Bagan-Chouk road on AyeYarWaddy River bank. It is also called two-layer pagoda. The inner layer is Pyu-era creation and was exposed when the outer Bagan era layer was destroyed by an earthquake.This is art of 11 AD. Apart from the unique architecture, the tranquil feeling with cooling breeze from AyeYarWaddy River is so satisfying. You can also see Law Ka Nan Dar temple beside the river from the upper part of this pagoda. So, if you want an uncrowded river view for your Instagram, this is the place of choice. It is named after a golden bowl in front of the temple. But now the bowl is in Bagan Museum. The temple is located in Angel’s cliff of AyeYarWaddy River bank. So, this place can give you the unique bird eye view of AyeYarWaddy river from its pretty high cliff. And there is also a tunnel under this temple and it reaches up to the river. So, in just one place, you can enjoy the river view, mountain feel, tunnel and also very mesmerizing sceneries of the white temple at the back ground of small pagodas and the river. When you search this photo-worthy place at google map and go there, you will see a statue of lion and the beautiful stairs near Thet-Taw-Gu monestry. To get the best of it, go there at the time of sunset and climb down along the steps until the harbor of AyeYarWaddy River. And you can enjoy the sunset which is clear from anything as you sit comfortably on the steps. You can also take your SNS profile besides this grand lion statue and stairs. It is also near Shwe-Tha-Paik temple. When you come from Nyung-U, it is in Taw-Kyung-Gyi monastery compound. From the top of this pagoda, you can enjoy the view of Shwe Tha Paik, ThaKyaMuNi and the river along with the soothing breeze. And you will get your Instagram picture of AyeYarWaddy with moving ships of various sizes in it. If you want to visit the above places or if you want to have wonderful time in Bagan, please click https://www.green-myanmar.com. We are always ready to make your favorite trip with best services.